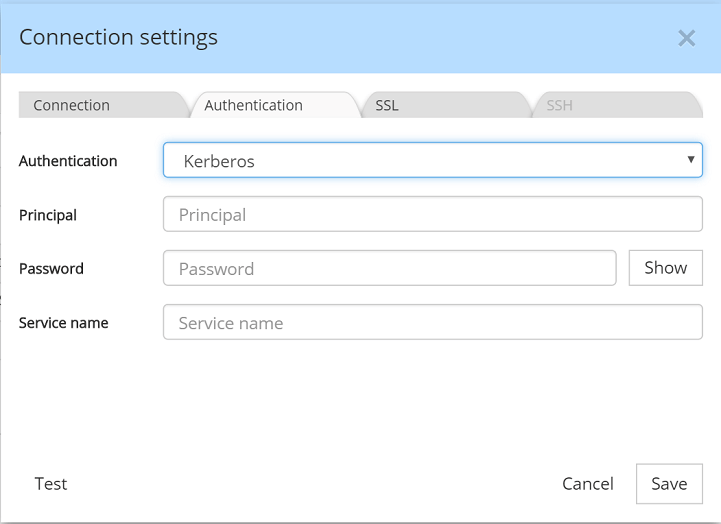 MongoDB Enterprise provides support for Kerberos authentication of MongoDB clients. Kerberos is an industry standard authentication protocol for large client/server systems. Kerberos allows MongoDB and applications to take advantage of existing authentication infrastructure and processes. For more info on how to setup Kerberos in MongoDB, please consult this link. A Kerberos principal is a unique identity to which Kerberos can assign tickets. Principals can have an arbitrary number of components. Each component is separated by a component separator, generally /. The last component is the realm, separated from the rest of the principal by the realm separator, generally @. An example for a Kerberos Principal is: primary/instance@REALM. A Kerberos Service Name is the name by which a client uniquely identifies an instance of a service. Typically, the service name for a MongoDB instance is named mongodb. Provide another name here if your MongoDB instance was set up with a different service name.